The Fritschi Vipec Evo has made improvements over its predecessor in many regards, but unfortunately our testing found it to be a bit too brittle for heavy use. We like a lot of the transition features of the Vipec, but we wish that the lifters were a bit heavier duty. In the previous model of the Vipec, we complained about the toe piece being rather hard to get in and out of. While our testers would tell you that the Evo binding makes strides in the right direction for becoming closer to a true step in binding, we still found it a bit aggravating to try and step in to the binding every time. It felt like dumb luck to trigger it perfectly, but we often just resorted to holding the toe lever down until we could get our toe pieces lined up. This may be caused by simply having too touchy of a trigger under the toe piece. 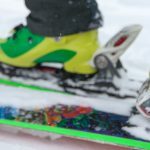 Once past the trigger however, the snap around the toe is convincing that you are locked in place, and as with most tech bindings, a quick pull of the toe piece has you set. We found that the toe on the Vipec Evo is a bit longer than that of others in the category making it easier to pull with our ski pole handle. This is probably our favorite section to talk about with regard to the Vipec Evo. We love being able to go from ski to skin and vice versa without ever coming out of the binding. This feature makes a world of difference when the approach/ski-out are rather flat or even rolly. It’s nice to free your heel piece and be able to kick and glide back out even if you aren’t putting skins back on. Moving from locked to a free heel is as easy as a pole plant on the small lever at the back of the binding. 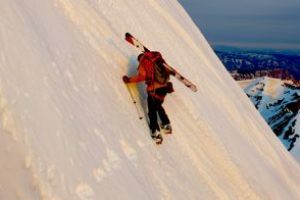 Going the other direction may call for a bit more flexibility while reaching down to pull the lever back up into the ski position, but having this as a feature makes it more than worth it. Flipping between levers is rather easy with either end of a ski pole, and the brake being independent of the mode of travel helps with tricky transition spots. The only spot that we have anything to complain about with regard to transitions on the Vipec Evo is the previously mentioned toe step in fiddle factor. 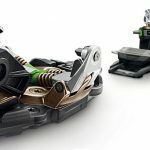 The gram counters out there will notice that if they skip the optional brakes, they can save about 99-100 grams over some of the bindings in the same class which on those long days is certainly a good thing. As will all things though, the weight savings come at a price. While other bindings in the same category use some type of metal to cover things like heel lifters, the Vipec Evo uses a fairly hard and dense plastic. Unfortunately in our testing we broke the medium heel riser into several pieces. The modular construction of the heel piece will allow for a rather easy repair that our testers can do themselves, but it would be pretty unfortunate to be out on an expedition or multi day ski tour and lose one of your lifters this way. One of our chief complaints about the Evo’s predecessor was that there is simply too much plastic, and unfortunately in our view, this hasn’t been addressed. The Fritschi Vipec Evo shines on the downhill. While many of the uphill parts may be plastic, they did put metal where it matters for the descent, though I’m not sure you would find our testers hucking their meat on this binding. The toe piece and the heel piece have their own independent release settings, something that is unique to this binding. The toes have a lateral release that is one of its kind for a tech binding and we think it is a great safety feature! Power transfer feels fairly natural, and our testers didn’t have any issues with pre-release on the descent, despite skiing through many different snow conditions on and off resort. We don’t think that the Vipec Evo’s would hold up to daily resort downhill for any sort of an aggressive skier, but we’ll say it again: it’s not what tech bindings are designed for! We think it is a good feature to have brakes be optional, and the Evo does just that so that the individual user can decide what’s best for them. Independent toe and heel release settings leave us with a sense of confidence that we are set up where we want to be as far as coming out of the binding goes. Our testers skied them with the toes locked out (no fall zones) and in normal ski modes with no issues whatsoever. The toe and heel pieces leave no doubt as to whether you are in the binding or not, and our users never found themselves in “tele mode” accidentally. Tech bindings have gone through the rough in this department in recent years, and we think that outside of the race category, this is an important breakthrough. The only thing that leaves a doubt in our mind with this binding is that plastic dominates the materials used to build it. The Vipec Evo improves upon it’s past, but fails to live up to a backcountry beating.